The Vivarini name was well known in Venice throughout the 15th Century, as Antonio Vivarini and his brother Bartolomeo, as well as Antonio’s son Alvise were all accomplished painters. Bartolomeo is noted as having trained his nephew Alvise, who went on to become a leading Venetian painter, amongst Giovanni and Gentile Bellini of the Bellini family of painters. Bartolomeo is also noted to have trained in oil painting under Antonello da Messina (1430 – 1479), the first Venetian to work in oil in 1473. It is also said that he trained under his brother Antonio as well as later collaborating on works with him. Bartolomeo’s unique style emerged in the influence of Paduan painting, in artists such as Francesco Squarcione (1397 – 1468). There was also a marked turning point in Bartolomeo’s artistry after he was exposed to the work of Andrea Mantegna (1431 – 1506). It is interesting to note that Mantegna was the son-in-law of Jacopo Bellini, father of Giovanni, in the small community of the Italian Renaissance. These works of Bartolomeo’s, influenced by Mantegna, were an altarpiece done in 1464 in the Accademia of Venice, and other altarpieces throughout Venice, completed from 1473 – 1477. Though he continued to work late into his life and his last documented work was done in 1491 in Lombardy. The name Vivarini, as translated from Vivarino, means Goldfinch, which Bartolomeo often used as a signature for his work. 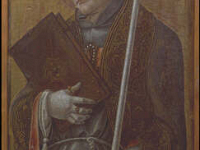 His work seen in the Uffizi Gallery is, Saint Louis of Toulouse, painted in 1467. 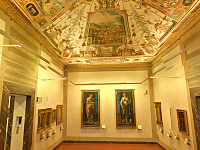 With quite an extensive body of work, his pieces are seen today, in Milan at the Pinacoteca, Ambrosiana, the Pinacoteca Nazionale di Bologna, the Rijksmuseum, the Getty Museum, the Harvard University Art Museums, Honolulu Academy of Arts, the Louvre, Boston Museum of Fine Arts, the National Gallery of Art in Washington D.C., National Gallery of London, the New Orleans Museum of Art, and the Philadelphia Museum of Art.